Sarah Cooks: Saturday Night Baking: Taiyaki!!!!!!!! I repeat: TAIYAKI!!!! I made my own taiyaki last night, having bought a funky pan on the internet. (I just did a search on Amazon.com, it was $AUD80 including shipping from the US). Taiyaki is a super-delicious Japanese snack. It's made of a pancake-type dough filled with an pan (e.g. red bean paste) or other fillings, and cooked in a fish-shape mould. They're generally available in street stalls, and food courts, and at festivals. We had similar kaitenyaki (round shape) from a roadside vendor in Osaka whilst in Japan in '07, and fell in love with them! Taiyaki also feature prominently in my favourite anime, Azumanga-Daioh, when the impossibly cute Chiyo-chan takes a walk with the spacey Osaka-san during the cultural festival at their school. 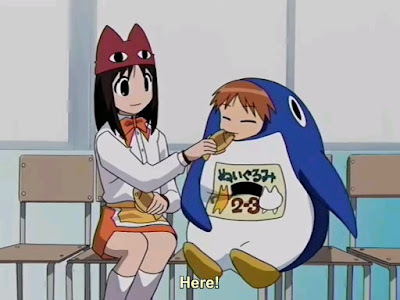 Because she is wearing her penguin costume, Chiyo can't eat the taiyaki herself, so Osaka-san has to feed her. "Do you wanna start from the tail or the head?" I haven't found taiyaki in Melbourne, and whilst I think you can get round kaitenyaki in packets at Japanese grocers, they're never quite as good as fresh ones straight from the pan. The ones here are also pretty much always red-bean filled, and whilst I love red-bean, certain people I know can't stand it, and have to have custard in their taiyaki. The instruction on the box were in Korean, so unfortunately I could not read them. Googling recipes for taiyaki wasn't much help either, so in the end I just made my favourite waffle batter from The Roux Brothers on Patisserie. For fillings we had red bean (from a tin), and custard (a quick crème pâtissière I made). Because I couldn't read the instructions, I brushed the mould with melted butter before cooking each one, but I then discovered that the mould is crazy-non-stick - no oil or butter required! When I was halfway through cooking them, my Dad came home, and I had the brilliant idea of making kaya-filled ones for him and mum! Just like the kaya balls you can buy in foodhalls in Malaysia. Yum yum. For those of you who don't know, kaya is Malaysian coconut & egg jam, flavoured with pandan. Kaya makes me proud to be Malaysian. Custard filled. And yes, those are flecks of real vanilla - I still have a huge stash of cheap and fabulous vanilla beans that I am slowly working my way through. And the next morning... we used the leftover dough to make waffles! I really liked the fluffy dough of the previous night's taiyaki, so I made some plain ones in the taiyaki pan too. The breakfast of champions: waffles, taiyaki, red bean, creme patissiere and strawberries! Interesting fact: strawberries + creme patissiere + crunchy waffles tastes like a French strawberry tart. I really, really liked the plain waffles cooked in the taiyaki pan, even better than waffles made in the waffle iron. They were soft and fluffy, compared to the crispy regular waffles. I also think that domestic electric waffle irons don't do waffles justice - they don't get hot enough and you don't get that wonderful contrast between crispy outside and fluffy inside. Until I can justify splurging on a stove-stop waffle iron, I'll be using my trusty taiyaki pan for waffles. I am SOOOO incredibly envious! I was eyeing that off on amazon a month ago, but didn't end up buying it. @bookshopaddict @sarahcooks Have I told you how much I love your food blog? I mean, really, really love it. The taiyaki looked AMAZING. Stickyfingers - Thank-you! That breakfast sounds like heaven! Helen - Hehe, I know, I had sooo much fun playing with the fillings. Cindy - Haha, I think these fish are definitely safe for you and Michael. Mellie - Omg, best investment ever. I bought it in May but only *just* got around to using it. *blush* My friend and I are planning on having a taiyaki party/Azumanga Daioh marathon, LOL. CityW - Great idea! Like bah chang kueh. Yummm! Nat G - i just read your taiyaki blog post and i am amazingly jealous right now. i'm ashamed to say i've only ever had the ones you buy at the asian grocers. and p.s. how good is kaya! that's AWESOME sarah! like mellie I've also been eyeing the one on Amazon but just can't bring myself to buy it just yet! oh my! i want a taiyaki pan now too!! Wah, I'm jealous, of the pan and the brilliant idea to put kaya in the filling. Mmmmm, you can't see it but I'm drooling at the photo now. I love kaya. Epicureal - Awesome vid! Thanks for the link! Thanh - I see a new weekend baking project for us, hehehehehe. We could even make kaya, if you bring the pandANUS! Gorgeous!! And that anime looks adorable :) Have to admit I can only deal with a little red bean - something about the texture - so the custard ones sound more my scene. Did you use a gas stove, hot plate or induction? I just got a pan myself and don't want to ruin it on the induction stove without having researched first. Hi ChyiX2 - it was a gas stove I used!